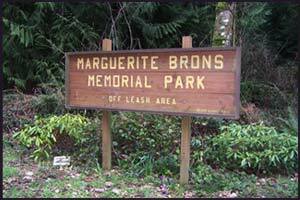 Offering 13 acres of meadow and woods, Marguerite Brons Memorial Park has proven to be very popular with local dogs and their humans. The park is completely fenced allowing humans to relax and socialize while their doggies can run and play safely. The park consists of 3 different areas: a small dog area, a large open meadow, and an even larger wooded area with trails. The meadow portion of the park is approximately two acres with a covered picnic shelter, a water station and a covered bulletin board. Toys and poop bags are provided. A separate fenced area for small dogs with a separate gate is adjacent to the meadow portion of the park. This area is lighted, with power supplied by a the new electrical system described below. 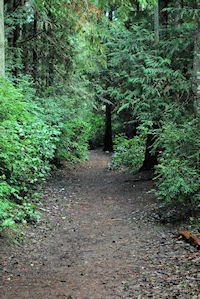 The wooded section of the park, an area of about 11 acres, is criss-crossed with well-maintained trails and is perfect for dogs who like to follow a scent through the woods. This area is also completely fenced, with gates allowing entry from the field or directly from the parking lot. Thanks to a $40,000 grant from “Fosters in the Community” on behalf of Foster’s Wine Estates Americas the Marguerite Brons park now has fresh water available for the dogs to drink and lighting for those early morning and late winter afternoon visits to the park. The grant provided funding for construction of solar collectors, drilling of a water well, installation of a pump, and installation of area lighting. Other major contributors to this project were PSE, Whidbey Sun and Wind, Bob Dalton, Double R Rental, Andrea Slichter, Mark Rose, Pat Buchanan, and Island County. How to get there: From SR 525 head south on Bayview Road about 1/2 mile. The park entrance is on the left (south) side of Bayview Road.